Does investment and entrepreneurship have a role to play in international development? Lawmakers are currently exploring creating a new U.S. International Development Finance Corporation (IDFC) to invest in and draw private capital to international development projects in exchange for equity. But the idea of unlocking finance to promote growth in developing countries is not a new idea. USAID Development Credit Authority (DCA) targets emerging markets where small businesses cannot access the loans they need to grow and offers risk-sharing agreements to mobilize local private capital to fill the financing gap. Through DCA, more than 500 guarantees between financial institutions and USAID have made up to $4.8 billion in private financing available for more than 245,000 entrepreneurs around the world. When we started working with DCA in 2017, we wanted to communicate this global impact in simple terms to broader audiences. So we settled on three strategies based on the questions we wanted to answer. First, we wanted to connect the community not just with DCA’s mission, but with individual entrepreneur stories and how they and their communities were affected by access to loans guaranteed by DCA. The resulting 2-minute animation on Mobilizing Local Wealth for Entrepreneurs Around the World tried to tell the story of individuals in different countries, contexts, and industries through kinetic text and light character animation. The negative-to-positive shift in music is accompanied by a color palette change to represent an unlocking of the full potential of development dollars for entrepreneurship. As with many of our animations, this tried to answer the “why” question for the relevance and importance. 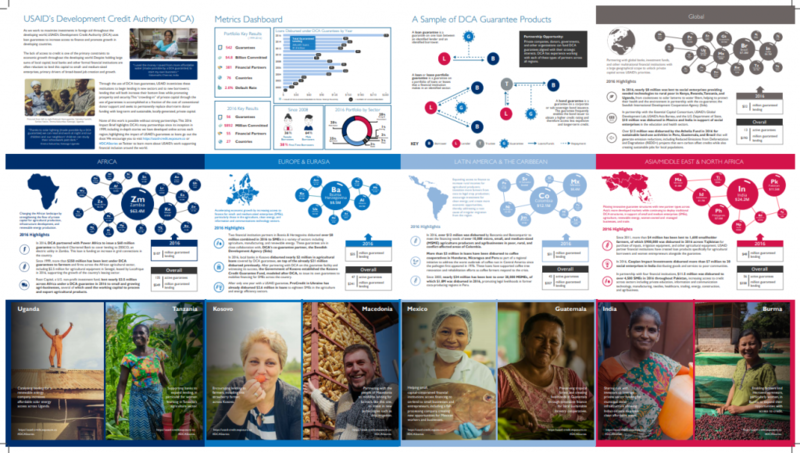 Second, we wanted to create an informative annual poster for the 2016 DCA Impact Brief that would hang in every USAID mission to answer “what” had been accomplished in the previous year using attractive infographics, “where” the impact had taken place along with highlights, and a reminder of “who” was benefiting from the investments. While not everyone will click a link and watch a video, a poster hanging in a hallway is a printed physical prompt to engage with information. Click on the image above to check out the full poster online! And lastly, we wanted to create a series of explainer videos using a combination of whiteboard-style animations, motion graphics, and 3-D effects. While the first animation sought to connect viewers to the entrepreneurs who were improving their communities, these videos attempted to explain concepts using representative animations and statistics. The animation was intended to connect viewers with information, rather than with other people. These are just a few examples of of how we’ve tried to communicate impact. If you’ve seen great examples, share them with us at @techchange on Twitter!